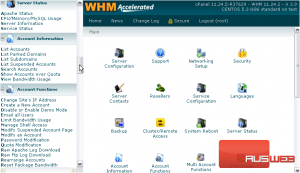 WHM contains a useful tool that allows you to view a chart of bandwidth usage per account on a monthly basis. 1) Go to Account Information. 2) Select View Bandwidth Usage. Here is the Bandwidth Usage page. This tool logs HTTP, FTP, and e-mail traffic, which accounts for almost all traffic that a normal account will use. To track bandwidth for other applications, such as a game server or voice server, you’ll need to use a tool such as bandmin. Note that subdomains that have not transferred any bandwidth trackable by this system will not be shown. If any bandwidth was transferred on a parked domain, that bandwidth will be included in the value shown for the domain on which the parked domain is parked. As you can see, we’re currently viewing bandwidth totals for the month of August 2009. This tool uses best fit units by default — whether that’s gigabytes or megabytes. 3) You can force it to use megabytes using this button. 4) Click again to switch back. 5) You can use the Last Month and Next Month links to switch to the respective months. Notice that we’re now viewing July’s bandwidth totals. Each row lists an account’s username and main domain. Next to that is the amount transferred for this month, then the current bandwidth limit, ending with a percentage bar that represents total bandwidth usage. When an account reaches 70% and 85% of its bandwidth limit, its row will be highlighted in yellow or red, respectively, as shown in the Legend below. If an account is a reseller, clicking this black checkmark next to the username will send you to a bandwidth list just for all the accounts it owns. If an account has any subdomains, parked domains, or addon domains with any data transfer for this month, you’ll be able to view them by clicking a + sign that appears, as shown in the legend below. You can change an account’s quota from here using these edit icons. The last statistic on this page is the Total Bandwidth Usage across all accounts, shown down here. That’s all there is to see here. 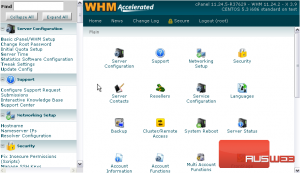 Now you know how to take a comprehensive look at your monthly bandwidth usage in WHM.